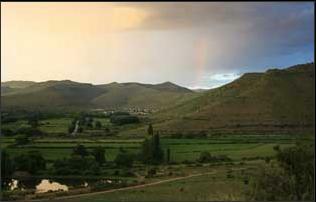 At first glance Nieu Bethesda appears to be a sleepy village, lying loosely at the foot of the Sneeuberg Mountains, awaiting the kiss of life. But do not be deceived – the heart of life beats strongly here – an unforgettable landscape, world-famous geology, wildlife and botanical richness also shelters remarkable people. Together, the place and people makes Nieu Bethesda an ideal destination for a few days (those who know better stay for a week and longer.) 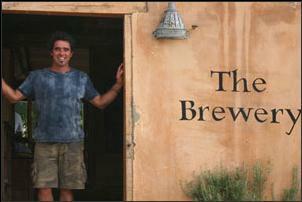 Come to unwind, relax and catch up with yourself and the infectious Karoo creative energy. You’ll leave refreshed and a little stronger. A hub of creativity with art gallery, working studios, open air theatre, restaurant & quirky accommodation. Bushman & Khoi Rock Art/Paintings / Private Fossil & Artifact Museum / Fossil walk / Medicinal plant walk / Sheep shearing explanation / Meerkat rehab. Acclaimed SA artist Charmaine Haines works within the realm of figurative clay, using abstract and stylised symbols and motives to embellish her sculptural and utility forms. 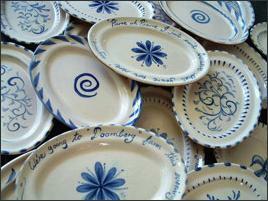 Martin Haines produces plates and platters in a rich peasant pottery style. 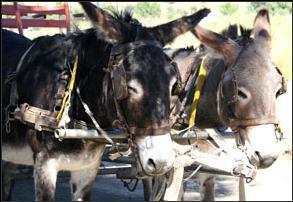 You can’t miss Jakob van Staden as he rides the most distinctive transport in the village. Leaving from the Owl House, Jacob’s guided tour includes Pienaarsig and is a highlight of any visit to Nieu Bethesda. 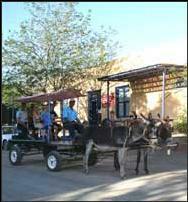 Seven years ago Jakob had a dream: a donkeycart that helped him share his love for his hometown. 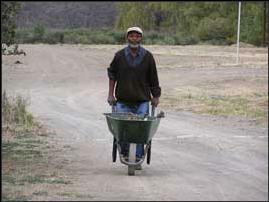 The first small cart has grown to a sturdy three-bench model he now drives. You’ll find him under the pepper tree in front of the Owl House. 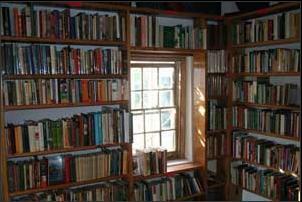 This welcome addition to the village offers a large variety of books in a relaxed and friendly atmosphere. Pop in for a cup of coffee and a chat, and if there is any book that you have been searching for, Victoria will find it for you! André will take you on a tour of the brewery and you can taste his homemade cheese platters under the trees or in the cozy brewery. With graves dating back hundreds of years, many of them unmarked save for their beautiful local stone, this is a peaceful and pretty place to spend a quiet time. See more on the home page. Still lit by gas chandeliers that pre-date the arrival of electricity in the town, the imposing white church asserts its presence over the entire valley. For a tour of the Church, please phone 049 8411 775. 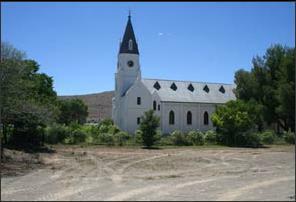 The Centre is situated next to the owl House and tells the story of life in South Africa 253 million years ago during the Permian Period. Discover why the Karoo is an important place for fossil finds and about the extinction event which destroyed most of the earth’s life 251 years ago. Take a half-hour stroll with a guide to the nearby Gats River bed to find real fossils. A quaint stone building houses this ancient water mill with a great view. Explore the small water mill that used to grind wheat and might again some day soon. The strange and wonderful Owl House created by Helen Martins in the 50’s and made famous by Athol Fugard in “The Road to Mecca”. Martin produces a range of handmade plates & platters and tiles. He works mainly in blue and white inspired by traditional early European porcelain called Delftware. 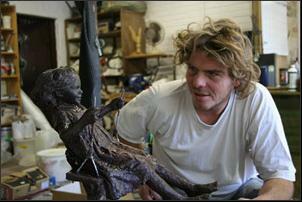 His work, unlike fine porcelain has more of a rustic finish giving it a more tactile ‘peasant pottery’ feel. Work available at the The Village Inn. 9-5pm daily. 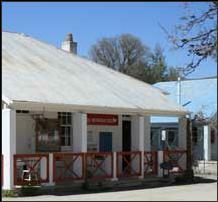 With this small museum, the Owl House Foundation pays tribute to a Remarkable Woman, Helen Martins. Years after her tragic death, her passion and art still inspire thousands of people that read about her work and visit her Owl House Mecca. 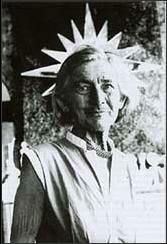 Here the visitor can see old archive photos, letters and documents of Helen Martins. 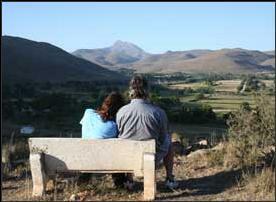 Enjoy a glass of champagne at sundown on a bench overlooking Nieu Bethesda with a wonderful view of Compassberg.